There seems nothing more boring than carbon black. It's just fine carbon nanoparticles which have been used for centuries in a wide variety of applications. Yet anyone who has formulated with carbon blacks knows that they are anything but simple. Faced with a bewildering choice of different grades of carbon black, how might one rationally choose the right grade? One answer is that the carbon and the formulation into which it is going should be as compatible as possible - making it easy to mix and disperse and to make it hard for the particles to want to clump together uselessly sometime during the overall manufacturing process. Of course there have been rule-of-thumb guides such as "for a hydrophilic coating choose a hydrophilic grade of carbon black". But the word "hydrophilic" is so meaningless as to be near useless. Far better is to define the carbon black with the three HSP to capture the three essential aspects of any system, its δD - Dispersion, δP - Polar and δH - hydrogen bonding characteristics. But how do you characterise the "solubility" parameters of a material that is clearly not soluble? The answer is to be pragmatic. Take a carbon black, attempt to disperse it in ~20 solvents that span HSP space and see whether the carbon black is "happy" or "unhappy" in each solvent. The deliberately unscientific use of "happy" is there to allow the formulator to interpret the experiments in a way that is meaningful to them. For one formulator, a carbon black that is dispersed with a quick swirl of solvent is the only definition of happy. For another the definition might require sonication and then stability measured in weeks. It all depends on the application. But the end result is a set of solvents scored "1" for being good solvents and "0" for those that are bad solvents. Fitting those data via HSPiP quickly tells you if you have a carbon black that behaves relatively simply and gives a good Sphere and a clear value for the HSP. The two images are HSP fits of a "low" and "high" hydrophilicity carbon black. 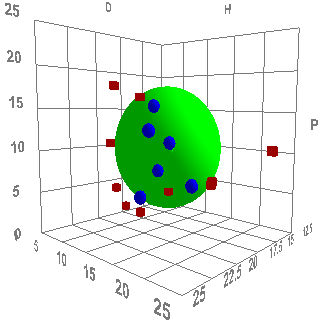 The HSP values are [16, 10, 7] and [20, 11, 12] respectively. These are real-world data and the different types behave very differently in different formulations. The differences aren't quite what the simple hydrophilic/hydrophobic split might suggest. They are both relatively hydrophilic. But the one with the lower δD values will formulate more naturally into low δD formulations (simple aliphatics) whilst the higher δD will go better into high δD formulations (aromatics, halogens etc.). If all suppliers of carbon blacks were to simply put their HSP values on the data sheets, the harrassed formulator would have a much easier time. As Charles Hansen has often noted, there are many times when you don't want a perfect match with something like carbon black. Indeed, you want to be right at the edge of the Sphere (one of the many reasons it's so important to measure it) for some components and not for others. For example you might want the binder to be a perfect match for the pigment but for the solvent to be relatively bad (though not so bad that the pigment totally crashes out). Here's what Charles said on reading the first draft of this page: "In the carbon black example, my experience was that I also needed a solvent that was bad for the pigment surface but of course had to be good for the binder. If it got to the pigment surface before the binder there was less stability. I ended with n-butanol that dissolved a phenolic resin, but did not have any interest in the carbon black. What you write is also true, the binder should like the pigment surface very much indeed, and selection of solvent may not be important in some such cases. In my case, however the solvent was also important by not being good. I might have guessed at a low molecular weight binder also helping the problem to be worse, where one with strongly attached segments of some length would have improved stability." Finally, do all carbon blacks give nice HSP Spheres? Almost certainly not! Many carbon blacks are broad distributions with different functionalities. 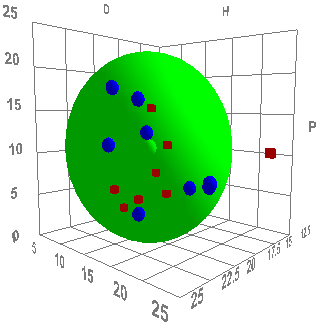 So the HSP Sphere calculation will give poor results. What do you do with a "bad" fit? Well, it's either good news or bad news. If you for some reason have multiple components in your formulation you might want a broad distribution within the carbon black. Alternatively, if you want to create an exquisitely tuned formulation within a relatively pure matrix, far better to use a carbon black with a small, high quality Sphere very close to the HSP of your matrix.